Having been available in Australia from September, 2017 the set was an immediate sell out in the land that has only two official LEGO outlets. With 835 miles (1345 km) separating these two stores - one a certified store and the other a Discovery Centre - there was a lot of LEGO fans missing out. So the news that it would be going out to retail put smiles on a lot of faces. 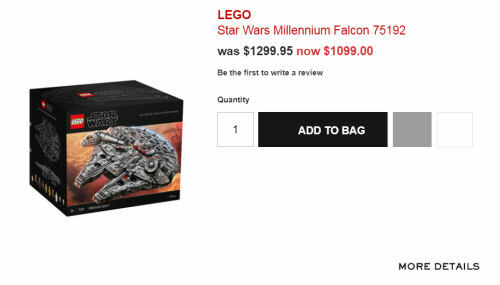 However, the expectation that the hefty AU$1300 (US$1000) would be discounted in the sales wasn't realised - until now because upmarket Australian department store chain Myers has dropped $200 off the set. The price drops starts today and will stay in effect until November 25th, unless the set sells out. To make the deal sweeter, reports Bricking Around, is news that from tomorrow (October 31st) supermarket chain Woolworths has upvalued their AU$200 Myers giftcard by 10%. A quick bit of mathletics says that if you buy five AU$200 gift cards at $1000 you'll net $1100, meaning you'll save a further $100, making it cheaper than the US region's price on LEGO.com! You can also pick it up at shop@home AU for the full RRP of $1300 and earn AU$255 in VIP points to spend at LEGO.com if you buy it before the end of October. Plus with the new LEGO distribution centre open in Sydney there are no international transaction fees and shipping time has been cut in half.